TuneTracker Systems LLC released a new remote broadcasting product designed to make remotes more fun, by clearing away the most burdensome obstacles to doing on-location broadcasts: bulk, complication, and expense. SignalCaster lets radio staff walk into a remote site carrying all of their gear in one hand and immediately begin sending back broadcast-quality audio. "Our hope in releasing SignalCaster is to change the 'dreaded remote' into something so easy that broadcasters will actually look forward to doing them," Dane Scott, SignalCaster Designer, said. SignalCaster Mobile, the "transmitter," runs on an iPad, and sends audio over any wi-fi or cellular data connection. SignalCaster Tower, the "receiver," runs on a Windows computer back at the radio station, and is left in standby mode, waiting for a connection. To begin broadcasting on-location, the announcer launches SignalCaster Mobile and taps the Start button. Back at the station, SignalCaster Tower begins receiving the audio signal, and it's immediately available to be broadcast through a control console or a radio automation input. 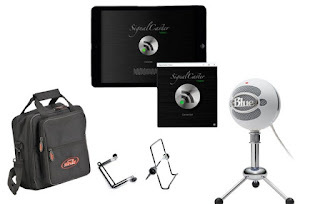 While SignalCaster can use the iPad's built-in microphone, the system is also offered in two different hardware bundles that give broadcasters the flexibility to use SignalCaster with professional mics and equipment. "SignalCaster Solo" comes with a broadcast-quality desk microphone, adapter, non-skid iPad kickstand, and a small, heavy-duty carrying case with padded compartments to hold everything, including the iPad itself. Solo is designed for single-announcer remotes. The desk mic's tripod stand collapses to allow it to be hand-held during interviews. "SignalCaster Duet" offers a dual-input mixer with monitoring, making it a good choice for sports broadcasts where two headset mics are commonly used. Its twin mic inputs are also good for other combinations, like a headset mic for the announcer and a desk mic for guests, or two handhelds. Either mixer input can also be fed balanced line audio from an external source such as a PA system. The Duet package also comes with a small, heavy-duty padded carrying case that will hold mixer, iPad, and more. SignalCaster software is $499, and includes SignalCaster Tower for Windows and SignalCaster Mobile for iPad. SignalCaster Solo is $679, including SignalCaster software, plus a broadcast kit that includes desk mic, kickstand, adapter, carrying case. SignalCaster Duet is $749, including SignalCaster software, plus a professional mixer for two headset mics or other configurations, plus carrying case. All the products and packages above are available today. All software and hardware configurations are detailed and orderable from the SignalCaster Packagespage.